Still working on my Mashup Camp inspired commercialization and licensing post, but given the volume of things still on my plate before I head to tonight’s Heartless Bastards show, doesn’t look like I’m going to get to it. As I told some folks earlier, however, I may be housebound this weekend because it’s supposedly going to be sub-arctic outside. Again. Snow was yesterday. I’m a big fan of the cold, but this is testing even my limits. Anyway, the usual stuff that doesn’t deserve its own post. Have suspended usage of the SPA-3000 (a Linksys device that patches regular phones into Asterisk) for the time being because it introduces a background hiss and occasional random tones onto calls. Will look into what the cause is, meantime, my home phone is still down. If I can’t figure this out, I have two options: 1.) see if an Asterisk VMWare image from Nerd Vittles solves the problem, or 2.) purchase a prebuilt hybrid solution from someone like Fonality (whom I spoke with this week). Retried Gimmie now that it has an applet implementation (here’s an account of my first attempt), but it’s erroring out on me looking for /home/sog/.gtk-bookmarks. I’ll try and create that manually to see if it remedies the problem, but the failed addition seems to have hung the GNOME menu interface. Are playing the Bluebird tonight at 9 and I’ll be there – and have an extra ticket. I’ve already seen these guys a few times and so I’m not quite as excited as I will be for the Flogging Molly show later this month, as I’ve never seen them, but it should be good. If by some miracle, you’re also at the show give me a ring. If you’re out and about in Denver, feel free to drop me a line – maybe we can meet up. Got my first S3 bill the other day: $12.56, including both bandwidth and the storage. For the peace of mind that comes from having our production server, a variety of other RedMonk assets not to mention my music collection backed up, that’s cheap (but don’t raise the price, please ;). Although we’re (a bit) late to the game, we do now have RedMonk Gear for sale, and I must say it’s really cool to see other folks picking it up (see Ric’s laptop inset). Per Cote’s pointer, we’ve currently got a CafePress store up here, but I’m hoping to cut us over to GoodStorm at some point in the future because their gear is much cheaper. Particularly since I ordered a sticker from CafePress a while back and it never showed up. While I thought they had a comparable selection, however, Cote and I can only find shirts on GoodStorm. 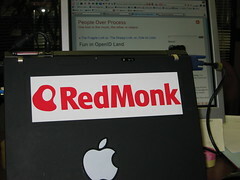 We’re looking for stickers and all manner of RedMonk schwag. Anyway, I’ll try to remember to start bringing some free stuff to the conferences I hit. On a related note, we’ve got our logo up in Flickr under a CC license if you’re creatively inclined and gifted with some free time. Patrick‘s been working some derivatives for us already. We’ll have to get the other icons and logos we have around up in Flickr as well. IBM’s Laura Cooney asked who the top thought leaders in open source might be, Luis jumped off from there (and very kindly included RedMonk and yours truly in his list – thank you sir), and James not only turned it into a game of tag, but tagged me in the process. 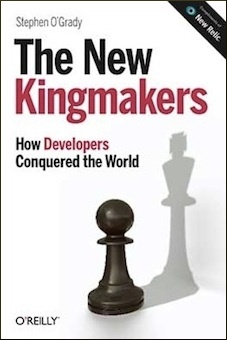 So now I’m supposed to tag my five open source thought leaders. Wow. Need to think about that one. I may a.) cheat by disqualifying anyone previously named, and b.) being a little liberal with my numbers. As Cote notes, all four RedMonkers are going to be in San Francisco next week. We’ll be attending the annual Sun Analyst conference, so it’s probably going to be a Sun heavy next week. Anyway, I’ll be out Monday morning arriving in SFO @ 10 (in theory), returning very late Wednesday evening. As always, if you’re in the area and want to meet up, drop us a line, although our schedules are mostly spoken for at this point. Not to worry if you miss us, I should be back in the area pretty shortly. blink… linuxworld is not dead? wha?